How much does it cost to travel to Belize? How much money will you need in Belize? BZ$123 ($61) is the average daily price for traveling in Belize. The average price of food for one day is BZ$36 ($18). The average price of a hotel for a couple is BZ$127 ($63). Additional pricing is in the table below. These average travel prices have been collected from other travelers to help you plan your own travel budget. Located beside Guatemala and Mexico, this Central American country is a popular travel destination for it's beautiful beaches, wonderful snorkeling, and fascinating culture. It's the only English speaking country in the region so it is a popular first time destination for travelers to the area. Most visitors head to the long Caribbean coastline. This part of the country has a similar feel to many of Britain's former West Indian island colonies and there is a substantial Afro-Caribbean population. In the more inland areas the population is mainly made up of native Mayan groups. Spanish is the most frequently spoken language in these inland areas. In addition to the appeal of its beaches, many people head to Belize so they can explore its jungles, see wildlife, and visit the Mayan ruins. Because Belize is such a small country, it is fairly easy to explore it by public transportation. Most of your trips will be fairly short and pain free. Buses are the best and cheapest way to get around. Most of the public buses are actually former U.S. school buses that are well decorated and fun to ride. Riding a local bus here can be an experience in and of itself. Belize is a popular destination for adventure sport enthusiasts. You can enjoy any number of activities ranging from zip lining to scuba diving, kayaking, or cave exploration. Whatever your style, you're likely to find something that appeals to you during your time in this beautiful country. It's a relatively cheap travel destination, although, due to its popularity, prices are higher than some nearby countries such as Guatemala or Honduras. The currency is locked firmly to the U.S. dollar and is consistently worth exactly half of its value. Because of this, many places do accept U.S. dollars as a form of payment. In the more touristy areas you're likely to pay a little more for food, but you can usually get a simple rice and beans dish for a reasonable price. If you're on a particularly tight budget try to stay away from the restaurants frequented by tourists. There are always some local options nearby where you're sure to save some money. Belize has a tropical climate with its rainy season coming between May and November. Hurricane season is between June and November as well, so if possible, this time is best avoided. If you do plan a trip to the area during these months, make sure you have good travel insurance. The dry season in the country is between February and May. Buses are a fun way to travel around Belize. You can buy tickets at any of the bus stations around the towns, or you can stand on the side of the road and wave a bus down. There is usually both a driver and conductor on the bus. The conductor will collect your ticket money once you are seated. The water taxi is another fun way to travel around the country. It travels between a handful of different cities. The main company is the San Pedro Belize Express and the easiest place to pick up the water taxi is the Brown Sugar Terminal in Belize City. Scuba diving is a very popular activity in this country. If you're looking for affordable diving options you can go through one of the vendors that are found along Ambergris Caye or Caye Caulker. The most popular excursions go to Hol Chan Marine Reserve as well as Shark Ray Alley. These dives typically cost about US$35. You can book a dive to the Blue Hole but you will pay substantially more for it. When quoted a price for an item, always assume you are being given the price in Belize dollars, which are half of the value of the U.S. dollar. If you assume the price has been given in U.S. dollars then the vendors will jump on the opportunity to charge you twice as much. Always assume the lowest cost and begin negotiating from there. Zip line Tours: Zip lining is a popular activity in the area. Many people choose to experience the jungle areas by participating in a zip line tour. It allows you to fly through the canopy at fast speeds. You're unlikely to really see wildlife, but it does offer a rush for adrenaline junkies. It can be an expensive activity, but is a fun thrill that you should try at least once. Old Belize: Located in Belize City, this attraction offers you a unique opportunity to step back in time and see what life may have once been like in the area. The exhibit offers a great perspective on the area and is a good way to learn more about the culture. 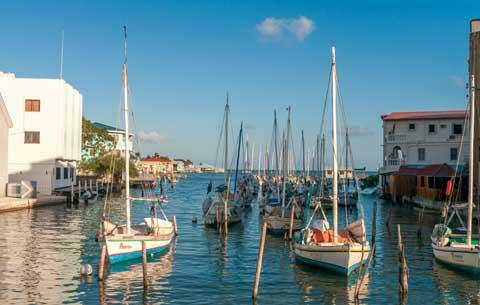 It highlights artifacts and culture from historical periods of time throughout Belize. Hol Chan Marine Reserve: This is a popular snorkeling and diving area that is accessible by chartered boat or during many dive trips through the area. It's a great place to see the area's beautiful coral and undersea wildlife. Most dishes in Belize involve red beans and rice. If you eat at local restaurants, which are your cheapest option, then the main meat item available is chicken. In tourist restaurants you will pay substantially more but you will find more seafood dishes and a wider variety of options. Local restaurants can be very delicious however, and whether you are on a budget or not, you should try the local specialties at least once or twice. Ceviche: Don't mistake this interesting dish for salsa. It's actually a well marinated seafood concoction that is often made from conch and vegetables. It's marinated in citrus which essentially cooks the raw seafood. Fry jacks: These are a tortilla like product that are most often served with breakfast. They are often accompanied by cheese, refried beans, eggs, or cereal which together make a traditional Belize breakfast. It's a filling option for starting your morning. Escabeche: This is a traditional Belize soup that is made from chicken, onions, and spices. The onions are often thoroughly marinated in vinegar to create an acidic base before the soup is prepared.